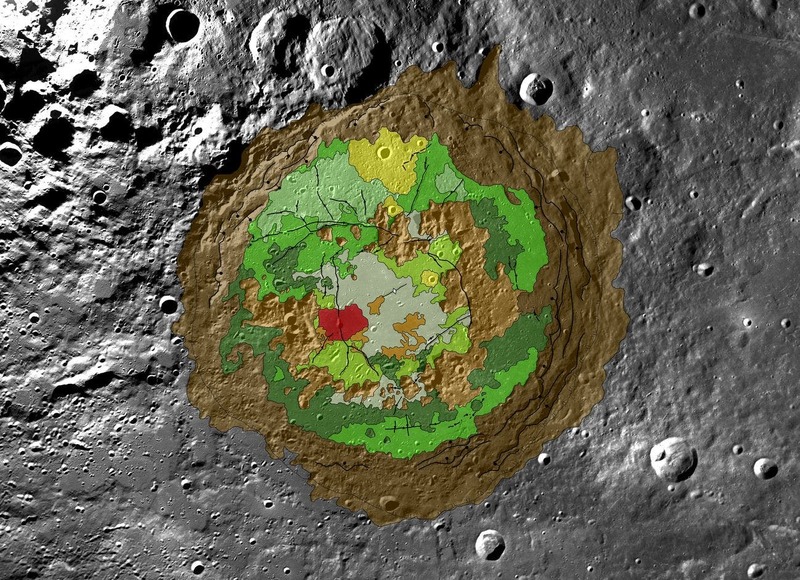 A new geologic map of the moon's Schrodinger basin paints an instant, camouflage-colored portrait of the lunar surface after a huge object struck the moon, revealing a patchwork of material, including the peak ring (inner brown ring), recent volcanic activity (red), cratering (yellow) and plains material (dark green and kelly green). The geologic record at Schrödinger is still relatively fresh because the basin is only about 3.8 billion years old; this makes it the moon's second-youngest large basin (it's roughly 320 kilometers, or 200 miles, in diameter). Schrödinger is located near the moon's south pole, a region where pockets of permanent ice are thought to exist. The map will help researchers understand lunar geologic history and identify suitable landing sites for future exploration. Schrödinger is an example of an intriguing type of basin called a peak-ring. Like the basin rim (brown outer ring), the smaller and more fragmented peak ring (brownk inner ring) is a mountainous region of crust that rose up after a huge object, probably measuring 35-40 kilometers, or about 21-25 miles, smacked into the moon here. These areas of raised crust are the oldest rocks in the basin and just about the only material that wasn't melted by the heat from the object's impact. The melted material was spewed in all directions and formed the plains. Patches of plains material can have slightly different textures and albedo (indicated by dark green and kelly green), probably because they cooled at different times. Fractures (black lines) formed in the basin floor as the material cooled. Schrödinger Basin is one of the few areas near the moon's south pole with evidence of recent volcanic activity. This includes lava flows from volcanic activity on the surface (beige areas) as well as explosive eruptions from a vent inside the red area; this vent has brought up dark material that mantles the plains (red area, which is newer than the beige regions). Older volcanic material is spread over a wider range (gray and lime green). More recent cratering by smaller objects has scattered material (yellow areas) near the top of the basin. Next to that (very light green beside yellow) is a region with a knobby texture that suggests loose material that could have come from cratering outside the basin or from a landslide on the basin's rim.